I hope you all had just a wonderful Christmas as I did and I thought I would make a small post with Christmas Day Instagrams and a little look at some of the presents that I got. Champagne with cranberries || Dinner table set for Christmas dinner || Malibu Snowcoco, from my dad. Here is a selection of the presents I got, I decided not to feature all of my presents as I didn’t want to seem as if I was ‘showing off’ and some presents I have started using and have thrown the packaging. Flask, Pandora Charms, Lady Gaga ‘Black Liquid’, Tigi S Factor Shampoo, Terrys Choc Orange. 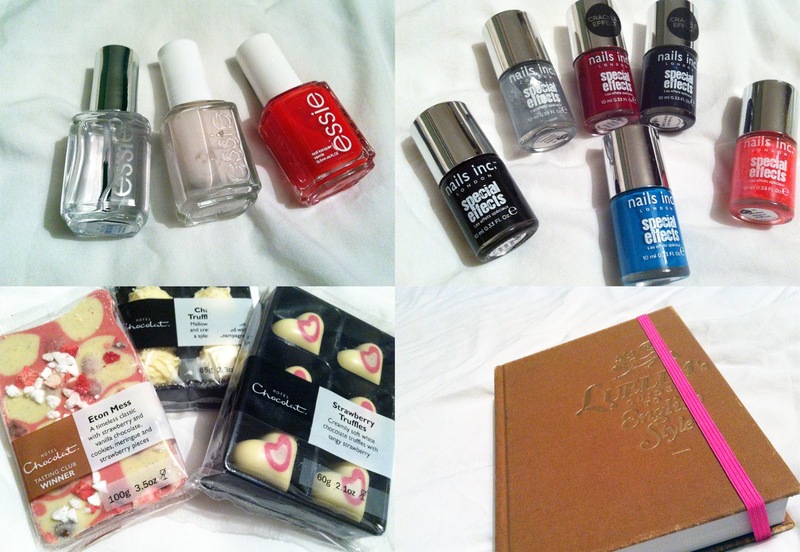 Essie Nail Varnishes, Nails Inc ‘Special Effects’ Crackle Nail Varnishes, Hotel Chocolat chocolates, Luella’s Guide to English Style. I am SO SO HAPPY with everything I got including my cute onesie which I couldn’t get a decent picture of but my main presents were my Pandora charms which I totally adore and wasn’t expecting and I also got little things to accompany them which my family pretty much picked themselves with little hints from me (well done parents!). Did you have a good Christmas? What presents did you receive?